The Greatest Royal Rumble is going to be quite some show! The Greatest Royal Rumble is one of the biggest wrestling events in recent memory. It's taking place right after WWE's biggest PPV of the year, WrestleMania, and boasts a card as good, if not better, than 'Mania's. Now it looks set to be just as long as WrestleMania. As you can see there are ten announced matches, including the largest ever Royal Rumble match. 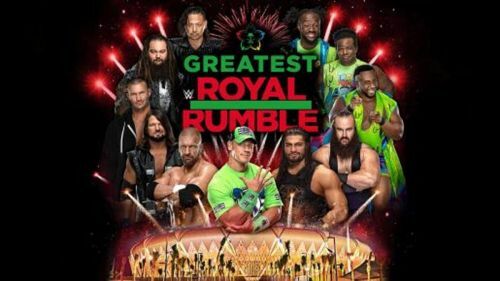 Given that we know each man will get an individual entrance in the Greatest Royal Rumble Match, and that there are nine other matches additionally, we can be fairly sure that it's going to be a long show. But just how long? Postwrestling.com have reported that the WWE Network has scheduled the Greatest Royal Rumble event for a five-hour window, not including the pre-show, which will be another hour beforehand. The show is mere days away and there's still a lot we don't know. We don't know who exactly will be competing in the fifty-man Rumble Match. We don't know the match order, or which matches will be taking place on the pre-show. The event will take place on April 27th at Jeddah, Saudi Arabia. What's incredible about this is that for many people live in Saudi Arabia, this will be their first experience of professional wrestling and it's going to be this huge six hour long spectacle involving as many of WWE's iconic figures as possible.